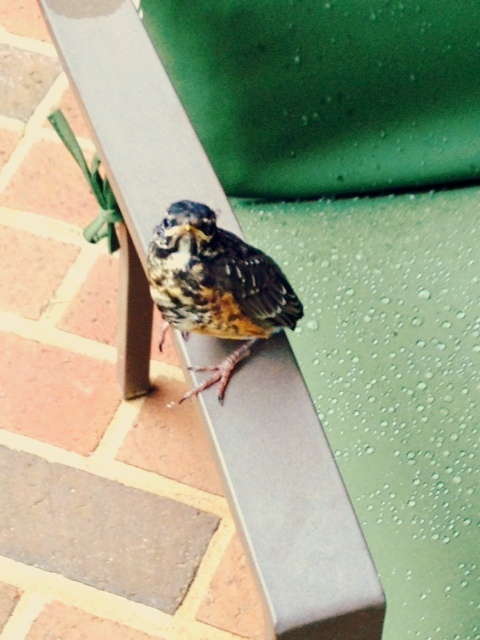 So, the other day, my daughter and I came home to find this little bird sitting on a chair on our front porch. As we walked up to the bird it didn’t seem phased at all by our presence. At first, I assumed that this poor thing was just traumatized because there was a strong storm that had just passed through and I guessed it had been thrown from its nest. As I looked at the little guy, it just looked right back at me as if it was the most normal thing in the world. It definitely seemed calm even though it appeared his little world had definitely been rocked a bit. Looking at this little bird eye to eye was a sweet moment, for me that is. It was not such a sweet moment for the mother bird! I soon realized the frantic mama was flitting and tweeting in the yard about 15 feet from the front porch where this calm little bird sat. 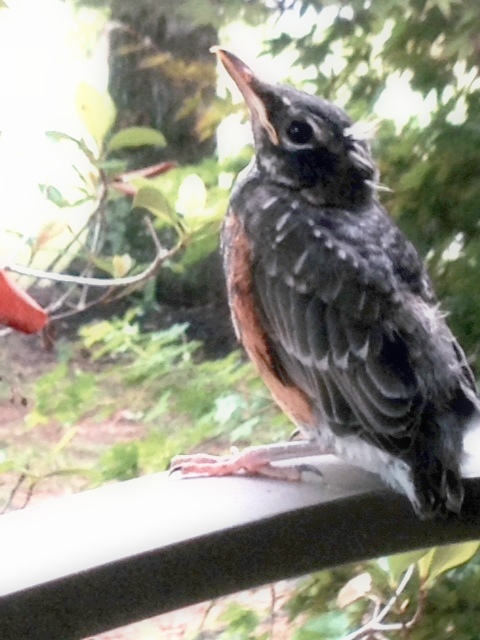 I decided I’d go inside to let the mother do her thing to help rally this little bird to fly. When I came out about 15 minutes later, this little bird and the mother were nowhere to be seen or heard. Mission accomplished it seemed. 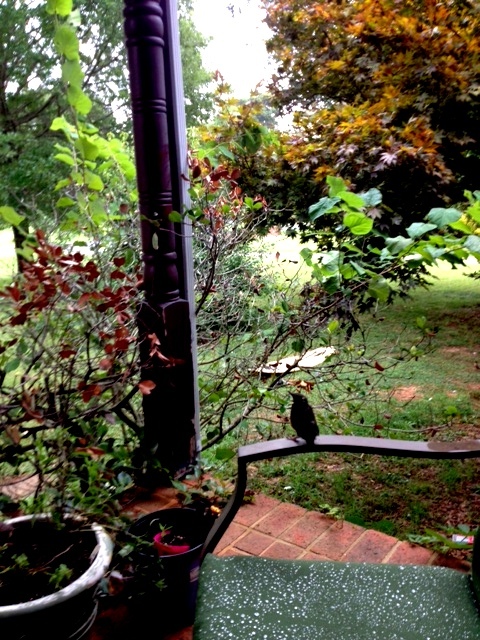 The little bird made me smile as I witnessed it being ‘calm in the midst of the storm’. I’m certain it was very aware of the mother bird flitting and flying and tweeting away. I’m also certain it was aware of the storm that went through. And it wasn’t even phased by a human being looking it straight in the eye and taking a few photos. But what’s sweet about it all is that this little bird had found shelter, and was content to stay there until it was time to fly. The little guy needed a respite, time, a shelter. It knew it’s little limits and wasn’t phased by what was going on around it. So, the analogy? I’m thinking that those times in my life when people are saying this and that, and circumstances are like a storm around me, I need to be like the little bird and know my limits. Sometimes we all need to take shelter in a world that definitely doesn’t encourage solitude. “Shelter” can be a quiet room, a room full of people we know and love, a car with the windows down. It can be a talk on the phone, or to sit in the sun or a walk in the park. It can be time well spent in the Word or a time of prayer. It can be singing a good song, getting lost in a good book, or taking a nap. But wherever it is, before we can find the gumption to try to fly, sometimes, we need to take a little recovery time, a little time to shelter ourselves from what’s been and what’s to come.